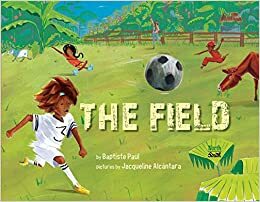 Summary: A group of enthusiastic children starts a soccer game on a grassy field in St. Lucia, shooing away a group of cows and building their own goal posts. Passersby lean on the fence around the field, watching the action. Even a rainstorm doesn’t stop the game, as the players take off their shoes and socks to slip, slide, and belly flop in the mud. Finally, the mamas call everyone in for dinner; the children go home, but continue to dream about futbol as they sleep. Includes an author’s note about his childhood playing soccer in St. Lucia and a list of Creole words and phrases used in the story. 32 pages; ages 4-8. Pros: Soccer fans will love the action in both the illustrations and the clipped text, interspersed with Creole words. Even those not familiar with the game will enjoy the sense of play radiating from each scene. Cons: The text could have flowed a bit more smoothly.